This week: Spatial brings AR collaboration to the workplace, Refinery29 proposes a new visual identity for mental health, the internet's first 'digital smell', Rent the Runway enters the co-working space and Dunkin’ Donuts builds a home powered by coffee. New York – The collaboration platform uses holographic transportation to remove the need for workplace video conferences or travel. 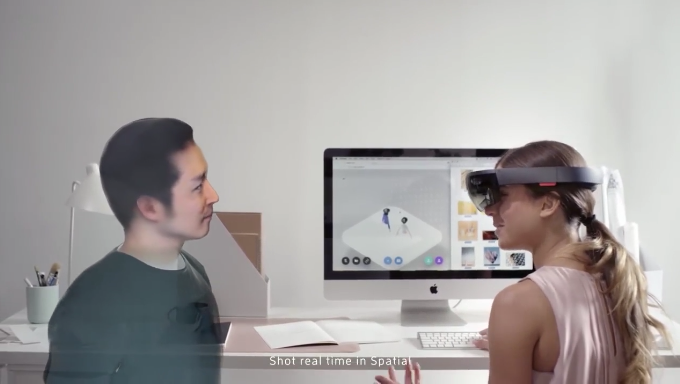 Using augmented reality (AR) headsets, Spatial connects users remotely in a digital workspace. When placed in the cross-reality conference, colleagues can see and talk to each other’s life-like avatars, which appear in the same room. Users can also brainstorm or visualise ideas through a voice-driven 3D web browser, demonstrating a new type of interface that isn’t confined to a computer. ‘With Spatial, collaboration becomes an immersive 3D experience where you can express ideas visually by just saying them, organise thoughts in the room around you and never let space confine your work,’ says Anand Agarawala, the company’s CEO and co-founder. With workplace technology focused on collaborative working, such augmented reality systems may soon replace individuals’ office computers. For more on preparing your workplace for new technology, explore our Far Futures portal.